Your business is growing, your overhead is expanding, and so is your IT infrastructure. But your IT needs are becoming harder and harder to manage. Servers are getting older, networks are outdated and inefficient, so you go to IT firms outside of your office. There are two options available at this point. They come around to your office when they can come around and fix the problem, only for the problem to reappear next week in need of fixing. The cost of maintaining your IT structures keeps going up and the problems keep coming back. Your efficiency goes down, your profits shrink, but your IT provider is making a killing. 42% of small businesses expect to increase their IT related expenses this year. You pay a flat rate for all your IT needs. Your servers are constantly maintained, your security always monitored and in place, your data safe, and your efficiency is improved. Your business’s IT problems are taken care of and your profits increase. When your business starts growing, hiring a managed IT services provider is the way to go. But what exactly do these firms offer? If you have been in operation for several years now then chances are your company still uses the same IT network from when you first started. Such a network will rapidly become inefficient and unworkable in a fast-changing environment. A dedicated managed service provider will assess your IT needs and build a new infrastructure tailored to your company. Your new IT network will be the best fit for your business needs. Efficiency and security are taken care of, time is saved, and your overhead is easily maintained. Your company has enough on its plate to worry about staying on top of a secure network. Your business cannot afford to wait around for an ondemand repair team to fix a hole in the wall. A managed IT services firm dedicates its staff to constantly monitoring and creating tight network security for your IT system. You are provided with backup and recovery of your servers and data plus disaster recovery planning with contingency plans already in place. Your business stays secure and in good hands. Your company remains competitive and running smoothly. Providing cloud services to your business is a must for any good partnership with a managed IT services firm. By using off-site servers your company can create a mobile workforce that can access files anywhere. Your workforce efficiency is improved and the reach of your business is increased. You can reach out to clients further afield and have a presence outside of just your office building. A good managed services firm will never leave you in the lurch. Something could go wrong in your office at any time, you need to know that your service provider will be in contact to help you. Likewise, a good business relationship does not keep useful information in one office. Business communication is essential to a healthy business partnership, and the right managed services firm will train your staff to deal with problems that may arise. Your company should never have to wait on you IT provider, and these services ensure that. Of course you want a readily accessed IT helpdesk, and a staff that can fend for itself. But you also want an additional human presence as well. Your managed services provider should always be a phone call away and do what it can to help prepare your staff to respond. You are not in the IT business though, your staff needs to concentrate on your business. An on-site support team can address any major issues that your staff or a helpdesk cannot. This way your business keeps running at performance speed while the IT problem is resolved. Partnering with a managed IT services provider is a solid benefit to your company. You no longer have to pay by the service provided. Instead you pay a flat rate for all your IT needs. You no longer have to wait for someone outside your office to come around to your office when they feel like it to fix an outdated network. Nor will you have to worry about bringing on staff or a group of IT experts on a fixed overhead. In the end you save time, money and productivity. But partnering with a managed services firm should be just that, a partnership. 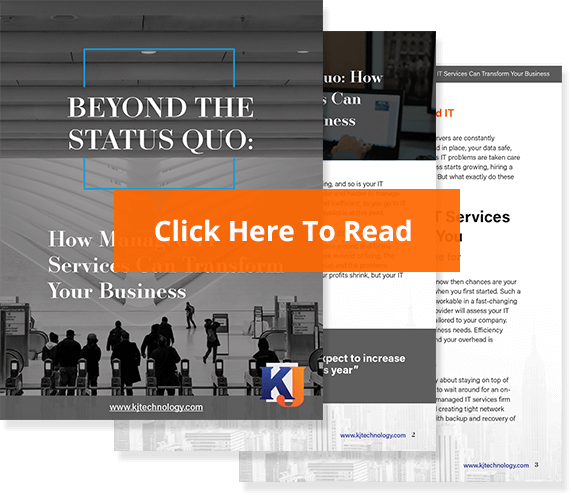 You want a managed services provider to go above and beyond to help your company. You’ve hired a managed service provider and your IT needs are taken care of. But you’re a small- to medium-sized business: Each new year you have to be sure that you are always at peak efficiency, that you are generating enough cash flow, and that you can still compete in a changing corporate market. A true business partnership with a managed services provider has a dedicated staff with the technical expertise to protect your IT interests but also a staff with the business acumen to help grow your business. You want a business partner that is a true business partner as well as an IT firm. A managed IT service provider should be able to help you stay competitive with each new year by locating where you are from a best practices standpoint and facilitating future goals. They should be able to work side by side to ensure your business future. When it comes to a business partnership, your success is our priority. KJ Technology can bring your IT infrastructure to its maximum efficiency and keep your business at the top of the competitive market. So why not give KJ Technology a call, and we can discuss how we can bring your business above and beyond, together.